True -- persistence and determination will get you a long way if you're given the chance. That was a lofty poetic sixer, Saru:) It crossed over the fence!! !Just lovely! Like the lady who commented before me said 'THIS IS A SIXER OF A POEM'. Brilliant Saru! 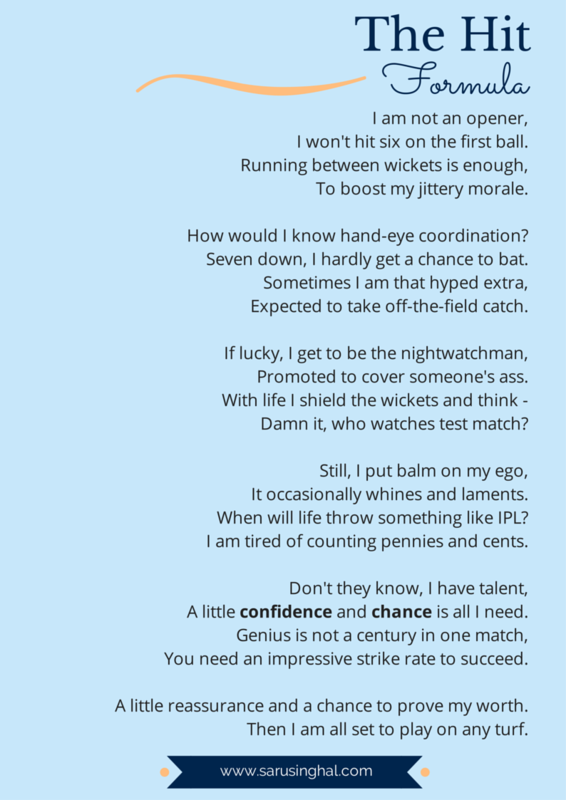 Your poem surely says a lot about the formula of success! Cricket and life's lessons. How well you write. Also, I love your creative photos. It is indeed a sixer. Persistence is important but people often want everything in one stroke. Beautifully penned, Saru. So Impressive, I'd love to learn it. Thanks for sharing this. Glad to hear that. Thanks for reading, Amrit. Saru, you have perfectly captured the thoughts and emotions of every such cricketer who despite being talented may not have got a chance to show it :). Lovely poem.